How can we prepare ourselves so that we are not caught off guard when we see public harassment or hear racist or insensitive comments? Building a more supportive community by interrupting everyday incidents, often takes skills that many of us don’t feel we have. 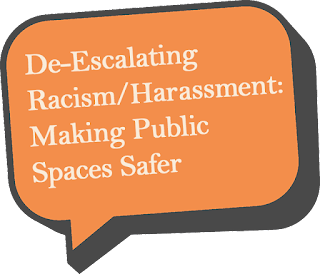 This interactive workshop can provide you with tools that help prepare you to interrupt or de-escalate such situations when they are happening. You will be trained to recognize harassment directed at yourself or others, and be given choices as to how to respond. Scenarios will be discussed including helping others who are being victimized as well as ideas on self-protection. Discussion and role-plays will be utilized. This workshop is presented by the Human Rights Council of Washington County (HRC). Facilitators will be Rob Solomon, retired mental health clinician and past president of HRC, and Peg Pfab, Secretary of HRC.